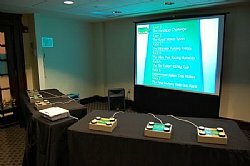 This Virtual Reality Game Rental-Horse Racing comes with a live commentator who announces each virtual reality horse race. A professional sound system is included including one speaker and one microphone. Up to 6 participants can compete in each virtual reality game horse race. Each race last no more than 1.5 minutes. This virtual reality game rental selection is quite popular as up to 240 guests can participate in one hour. Unlike other virtual reality game rentals, horse racing is very easy to play. The commentator will instruct each participant on how to play prior to each virtual race beginning. In front of each participant is a 4 button control panel which controls their virtual reality game horse. They become the jockey of their virtual reality game horse and through their own eye hand coordination dictate the speed of their respective virtual reality game horse. Once the virtual reality race starts, the buttons will begin to illuminate on the control panel. The jockey is to press the illuminated button and by pressing that button that moves their virtual horse. 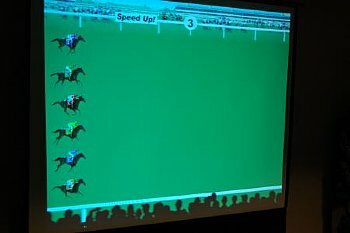 The faster in which the jockey presses the illuminated buttons, the faster their virtual reality game horse will move across the screen. This virtual reality game rental can be experienced on a projection screen or on multiple large screen plasmas. A 10 x 10 area is suggested. Each individual virtual reality game horse race can be customized for corporate events, galas & fundraisers. This feature is a way for organizations conducting fundraisers to raise additional funds prior to the event by having companies sponsor certain races. Events that have a horse racing theme such as Kentucky Derby nights, Nights at the Races as well as casino events that want to add an element of horse racing this virtual reality game is an excellent choice. Company team building events have used this virtual reality game in a variety of ways. 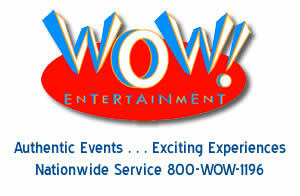 Contact a WOW Entertainment event specialist at 800-969-1196 to learn more about how this virtual reality game can be integrated into whatever your event you are planning. The overall experience of this virtual reality game rental is available by clicking on the following clip.